Kanyon is the special guest for the last S/mileage Station in August. She immediately starts of the show commenting on how amazing Meimi’s radio voice and asks her if she wants to be an announcer in the future. Meimi says that might be nice, but really she’s just trying to do her job. She knows she only got this job because she’s an idol but she thinks there might still be people listening who expect a more professional radio program, so she puts on a more professional, radio-esque voice for the sake of the show. Meimi: But really, Fukuda-san is awesome is so many more ways. Meimi likes the way Kanyon experiments with makeup and hair, but especially her singing. She says that Kanyon is very stable and she can sing things that Meimi doesn’t think she can. They have a lot of the same parts in songs, too, but Kanyon seems much more skillful in knowing how long to hold notes and memorizing the variances between sections of a song. Meimi reports that she has had directors and vocal coaches tell her to listen to Kanyon more for better practice. Meimi asks her how she listens to the songs that makes her remember them so much better. Kanyon: I simply like S/mileage’s music, is all. I listen to it all the time, but I think there are a lot of people who don’t listen to their own songs. Meimi: Ah, yeah, I don’t listen to our stuff at all. Kanyon: But if you listen to yourself, it really hits home that you’re an idol. Meimi: Don’t you hate listening to your own singing, though? Kanyon: Not at all, because I like my own singing the best. Kanyon clarifies, because Meimi seems a little confused, that it’s not about enjoying the sound of her own voice or pushing herself forward; it’s about getting familiar with her own singing and getting used to the flow of the song and how she sang it for the recording. Meimi asks if she is then comfortable listening to herself on this radio show, and Kanyon says yeah, sure. This corner takes the blind-draw pin-up posters (you remember, right? The ones Eripon did multiple times in an effort to get Gaki-san’s picture in virtually every UFactory Channel video before they deleted the channel?) which Meimi and Kanyon open and then discuss the members inside. Kanyon, after struggling briefly, gets Ishida Ayumi. The two are silent at first. Meimi says she really likes her, and Kanyon agrees that she likes her, but she hasn’t ever really talked to her. She says Ayumi is like a hamster and that she and Shimizu Saki have the same body type that she really likes: they’re skinny, yet muscular. Meimi recalls an incident with Ayumi and watermelon. Meimi enjoys watermelon, but not as much as Ayumi, and she prefers to have salt on her melon whereas Ayumi will only eat it plain. At a concert once, they had watermelon at catering and Meimi mentioned to Ayumi that she wanted lots of salt to put on it and Meimi says that Ayumi scowled at her. Kanyon says she can sympathize because putting salt on watermelon is weird. They both agree to pay more attention to Ayumi in the future. They move on. Kanyon: If you get Kumai-san trade with me. Oh no, why did they get this person? Ew, gross. She has a short hair cut, the shape of her mouth is her defining feature (her “Mt. Fuji lips”), and she’s short. It’s Takechan. First, they make fun of her picture. 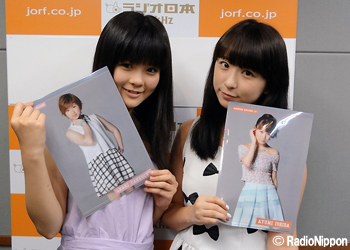 They say that Ayumi looks pretty good in hers, but they just want to laugh at Takechan’s. Meimi says she gets upset because she wants to sit next to Takechan or give her a hug or something and Takechan will push her away, saying that she has never liked that, but then Fukumura Mizuki will come along, and suddenly Takechan changes her tune and is all over her. Kanyon thinks something is up between those two, as they’re always making eye contact backstage. They also talk a lot in secret and whenever someone comes up to ask them what they were talking about, they both say it was nothing. Meimi thinks it’s strange because Takechan was like that even when Meimi first joined Hello!Project. She says that Takechan has known Mizuki for four or five years, but now Meimi has known Takechan for 3 years and she has never acted like that with anyone but Mizuki. They suspect something. Kanyon says that Takechan is also the only member of S/mileage to really get angry about things. Sometimes the staff will tell members to calm down or be quiet, but Takechan seems to get it more harshly because she got irritated with it. Meimi points out that Ayumi and Takechan have some similarities, like their builds are similar and they’re both really competitive, although Takechan tends to get angry and give up more easily. This message comes from Midori. The listeners were recently asked to write in questions for Meimi and Kanyon, and so Midori first has a question for Nyon. They consider her to be one of the most stylish members not only in S/mileage, but in H!P at large, and they love how cute she looks with her hair dyed black. However, they were especially taken with how she looked at Budokan with a light hair color. They want to know if she has any plans to go back to light hair. Meimi chimes in and says that she thinks that long, black hair is in style right now, and Kanyon says that she has recently added more black and red to her wardrobe so she thought she’d try dying her hair to match it, but she thinks she will have light hair again sometime in the future. What she really wants to do is cut her hair to look like Natsuyaki Miyabi does right now, but she doesn’t want to look like she’s copying her. For now, she’ll stay with black but she will go lighter eventually, and when she’s old she’ll get purple. 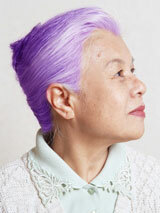 Meimi also wants to dye her hair pink when she’s old. Midori has another question for Meimi, also about style. They like how Kanyon experiments a lot with her hair color and style, but Meimi hasn’t really done anything with color. They like how cute Meimi is right now, but they’d like to see different sides of her in her style. They wonder if she has any plans to change things around? Meimi says it’s an issue of gender. She assumes that Midori is female, because the lady fans often ask Meimi to cut or dye her hair, whereas the male fans usually ask her not to do anything at all to her hair and keep it how it is. She says it’s very difficult to balance those opinions, so she think she’ll compromise by keeping some things as “pure” aspects (although she admits she doesn’t really have a “pure” character) but getting very decorative nails like Kanyon has. She has always liked the big fancy nails and wants to get some every time she goes to the salon, so maybe she will next time. She reiterates dying her hair pink or purple someday but for the time being she isn’t brave enough to go through with it. Kanyon thinks Meimi’s facial structure is strong enough to suit any hair cut or color so she should go for it. I think it’s strange that Meimei doesn’t listen to their own songs! Think about it though, she has to listen to s/mileage stuff for hours at a time at events, rehearsals, etc. You can only listen to the same songs so many times before you get tired of them. This was a great episode thanks Lurkette! I’m thumbing up Henkka’s comment not the original. I didn’t see the original comment, but judging by the username… that might be for the best. I laughed so much when they mentioned dying their hair purple and pink when they’re older. I live in Osaka and you’d be surprised about how popular this is for the Baa-chans. It’s a light powder purple or pink. I’m pretty impressed by them lol. > She assumes that Midori is female, because the lady fans often ask Meimi to cut or dye her hair, whereas the male fans usually ask her not to do anything at all to her hair and keep it how it is. She says it’s very difficult to balance those opinions, so she think she’ll compromise by keeping some things as “pure” aspects (although she admits she doesn’t really have a “pure” character) but getting very decorative nails like Kanyon has. Interesting. I also selfishly approve of her approach. Her Meimei’s hair is fine as is. I’m not sure how she’d look with fancy nails, but it might be… interesting?